You've enjoyed your stay in Esturiat, the sprawling adobe metropolis surrounding the only watering hole for leagues in any direction. It's been diverting, but Esturiat is no Khazan or Khosht or even Gull. It's time to move on - especially because no one's started bothering you about your ber tabs - and Tiern sounds like the perfect place to travel toward. This solitare adventure is suitable for individual humanoid characters of any level, with no more than 72 personal adds. A magic matrix is included. 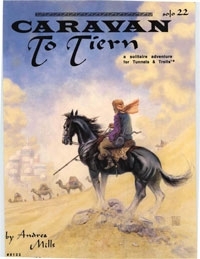 Caravan of Tiern is Solitare Adventure #22 designed for use with the Tunnels & trolls game system. You will need the T&T rules to play this game. This title was added to our catalog on November 06, 2009.